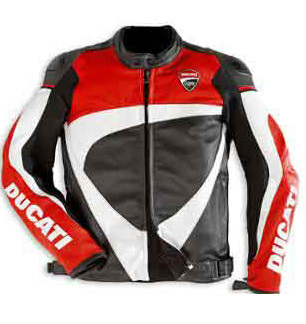 The new Ducati Corse jacket in cowhide is perfect both for the track and everyday riding. Complete with composite protection on the shoulders and elbows. Every detail of this jacket is a reference to the Ducati racing world, from the white, red and black colour scheme in a design updated for 2012 to the essential Ducati Corse shield in pure carbon fiber which stands out on the heart-side. Only for die-hard Ducatisti.